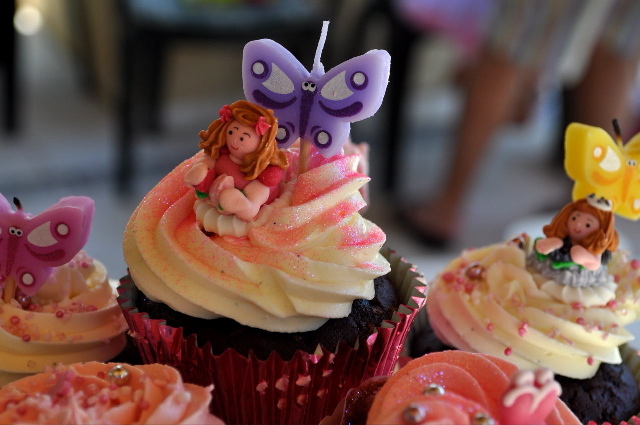 My sweet little Miss Three’s birthday was coming up and I was determined to present her with a tier of pretty pink cupcakes to make her huge blue eyes sparkle. I’m a confident baker so making large amounts of cupcakes doesn’t daunt me in the least but my Achilles’ Heel in this department is the icing or frosting. Actually it’s not so much poor technique or lack of skill that stumps me but not having the perfect recipe for miracle buttercream icing that pipes perfectly, or doesn’t turn into rancid sludge as soon as you take the cupcakes outdoors. So, who ya gonna call (or Google…)? Wilton of course! Cake decorators and bakers would be familiar with Wilton and their amazing range of products for cake making and decorating. You name it. Wilton has it. Their website is also a veritable wealth of baking knowledge and features oodles of wonderful recipes. The one I chose to use is a simple buttercream icing but Wilton has many other types to try. I was a little hesitant about trying this buttercream icing recipe at first as it contains vegetable shortening. Isn’t the darn icing going to be fat laden enough with all that butter it in? What does it even do? Vegetable shortening isn’t something you use that often in Australia whereas Crisco seems to be a common pantry item in the US. The closest thing we’ve got at the supermarket is Copha and I’m happy to say that this block of white fat *can* be used for something other than chocolate crackles! 2. Being white in colour, it helps maintain a white appearance in the overall icing and assists in accurate colouring. Both very good reasons to try this recipe. I wasn’t going to argue. Hopefully this doesn’t come off as a plug for Wilton but the tier I used at the party is also from Wilton. Fancy! To make: In large bowl, cream shortening and butter with electric mixer. Add vanilla. Gradually add sugar, one cup at a time, beating well on medium speed. Scrape sides and bottom of bowl often. When all sugar has been mixed in, icing will appear dry. Add milk and beat at medium speed until light and fluffy. Keep bowl covered with a damp cloth until ready to use. If using the Thermomix, chop the Copha up into cubes and chop on Speed 5/6 for 10 seconds or so. Add butter also cut up into cubes and combine together on Speed 5/6 for a few seconds. Add vanilla and the sugar a cup at a time, and use Speed 2/3/4 depending on how well the sugar gets integrated. The Thermomix works best when there is some liquid to assist with the movement of the ingredients so add a tablespoon of milk now. Keep combining sugar at various speeds until fully combined and smooth. Add remaining milk and colouring if using. Hurray! a solution to buttercream icing. I used to use an amazing icing recipe from ourbestbites but it involved more bowls than i can ever be bother with. also copha! i always buy too much stuff for xmas/parties so its good to know what else i could use it for. Your cupcakes are adorable! A vey lucky daughter indeed! Thanks :) I don’t know how I’d go making this recipe with a regular mixer but I guess it’s a matter of getting everything to room temperature as much as possible. Copha is a brick! I’ll keep a block in the fridge handy from now on though. I have also been on the hunt for a non rancid-sludging buttercream as well, so thank you m’dear! 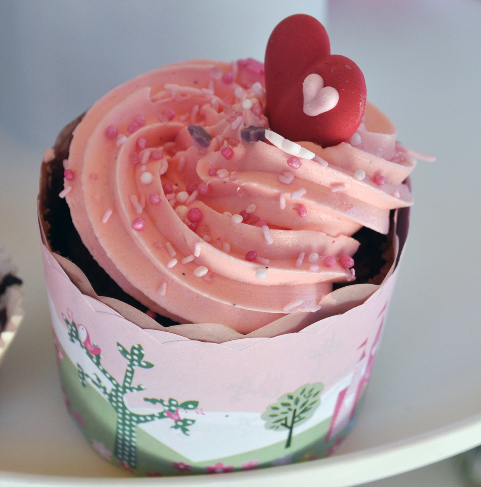 Copha scares the bejesus out of me, but I’m willing to conquer my fear for the sake of pretty cupcakes. I use this Wilton recipe all the time. It takes ages to mix the copha Monica! I use my “bar mixer” & get out as many lumps as possible (this takes ages & ages) then continue on using my bar mixer when adding the icing sugar by the end most lumps are gone. Is the US vegetable shortening softer then our copha? I wonder if its worth trying the stuff from David Jones. I always use Copha in my buttercream, but i grate it on a cheese grater before mixing, makes it much easier to work with. Thanks :) Yes, many people seem to do that as it is a hard thing to break down otherwise. I’m also using copha for butter cream icing but when I mix butter/margarine the colour always changes. Can u advise me of the butter I should use to have white colour icing? Thanks. If you don’t want to use this product you will need to find the least yellow butter or margarine available and make sure it is as fresh as possible. Butter tends to get more yellow the older it is and the longer it has been exposed to air. I don’t recommend margarine unless you have dietary reasons to not use butter; it tends to be quite yellow. Some of the European butters (Lurpak and other French ones) are quite light in colour. 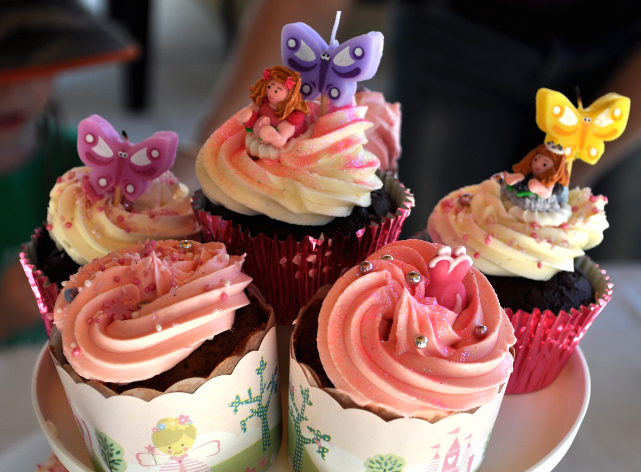 I saw your post on the Wilton forum and just wanted to come over and check out your cupcakes… They’re adorable! I also use the Wilton recipe as my basic recipe, and then substitute different extracts and stuff for flavor, depending on what I want. I have been using copha to make icing for years and took me awhile but have sorted now, always a crowd pleaser especially with the kids. I actually use all copha and then you do get a whiter icing. Hard work creaming it but well worth it. Thanks for posting this. The icing looks fab and I am going to try it on my son’s 1st birthday cake! Just wondering whether you needed to use the butterfly at all with the Thermomix? Hi, I live in Charlotte, NC and i took wilson classes and love to do akes. I really want to try this Copha and am hoping to be able to locate it. I feel the icing made with Crisco and even the hi-ratio shortening is great but tastes to greasy. You can feel the grease on the topo of your mouth and it turns me off. thank you for posting. Thanks for stopping by :) To be honest, I would chop up Copha as small as possible with a knife before inflicting it on the TMX. Copha frosting apparently fried my friend’s regular kitchen mixer. The TMX is mighty but not taking any chances! I found some Crisco and it is much easier to use but I much prefer the taste of Copha. I just had to pop back in and say, I made this icing tonight with Copha,and grated it by hand first, it blended beautifully, and made a wonderful ,light fluffy icing that held it’s shape superbly…thought I would share this tip. ‘Grate’ tip Trisha! Thanks (sorry, I couldn’t resist!). That would make it much easier for my TMX too! Have you ever had any trouble with Wilton colouring staining any parts of the TMX after making icing? e.g. lid, lid seal or o-ring on the blade? I have used all colours of Queen in my TMX and stainless steel Kitchen Aid bowl and neither stained. I think as long as you are adding dye to your mixture, it shouldn’t be a problem. Red or red based colours are weak so any stain tends to fade away eventually with some UV. Blue and green are strong but as I discovered with my Blue Velvet cupcakes, those colours will give you a nasty surprise the next day so I don’t use it strong enough to stain anything. The lid and ring are fairly dark too so if Wilton colours are really strong and do stain a little, I would think it will eventually fade too and you won’t notice it so much? 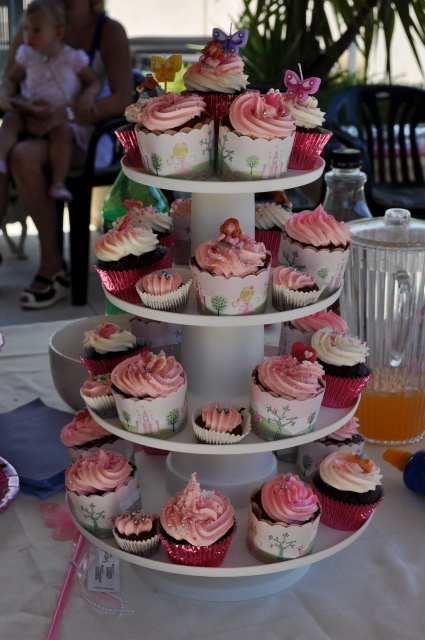 Gorgeous cupcakes, by the way! I haven’t been game enough to use Wilton colouring yet in my TMX as it’s so darn strong! This is just fantastic! Thank you so much for sharing! I’ve used your recipie twice now and it’s perfect! I’ve left the copha out overnight (24 hrs) and it is super soft so just chuck the copha & butter in my TMX together – just brill! thanks! Oh and no staining either & I’ve used red (2 pots!) and green :) Soo so good! Great! I’ve tried using Crisco and I have to say I do prefer Copha which has a less obvious fatty taste :) I tried Wilton gel colours recently and they didn’t even make a mark on the mighty TMX :) I’ll remember to keep the Copha at room temperature. Makes sense! Is confectioners sugar regular sugar or icing sugar? Thanks for bringing that up. I have included all terms for it in the recipe but confectioners sugar is also known as powdered or icing sugar. You sure can :)) Just make sure it’s super fine for light and fluffy icing. hi, i have just started with trying to make buttercream and was wondering when you add flavourings do you have to adjust any quantities of other ingredients? Hi Bronwyne. It will depend on what sort of flavouring. If you mean the concentrated stuff that you wouldn’t add more than a 1/2 tsp of, then you don’t need to modify any icing recipe. 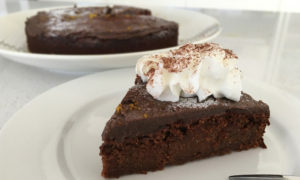 If you want a chocolate icing, then you probably need to remove an equal amount of the icing sugar for the cocoa you’d use, or add the cocoa and add more fat as needed to make the icing useable. If you were going to add a fruit puree then add a small amount and adjust the icing according to how that amount has changed its consistency. If the puree has made things too liquid, then add a small amount of icing sugar until the consistency is right for you. Hi…If I can get the cohpa soft by leaving it out overnight, could I make this icig in my kitchenaid mixer do you think ? Thank you so much ! The icing was perfect and the kitchenaid worked a treat ! When i make this icing i soften ( sometimes melt) the copha in the microwave first. Works really well! Great :) I’ll keep that in mind. Should make for a glossier icing too I think. Good question :) There is so much sugar in icing that it acts as a preservative of sorts. It supposedly absorbs any additional moisture that the milk culture hasn’t got much to go bad with. Things need air, water and warmth to go bad generally so I think you’re safe with icing/frosting. To be safe you can use water instead. As a non-thermomix owner *sob* I was wondering if you use heat when mixing? I have made W’s BC recipe once & used ALL butter… Definitely want to try the copha next time but unsure how you do it in the TMX….? Thanks :) Some people seem to like that unique, greasy taste and feel of shortening based frosting but I much prefer the less fatty frosting that copha makes. Of course, I like butter frosting the most but you can’t get it perfectly white. What about coconut oil instead of Copha? Much healthier as not hydrogenated. I love coconut oil/butter but it has such a low melting point that I’m not sure how it’d work in frosting that has to maintain shape. I think even butter holds better in warm climates. However, if you’re after a softer icing then coconut oil would be amazing. I must try it some time! You mentioned above that fresher butter is whiter then older butter. Have you ever made this with fresh butter made in the TM? BEST ICING EVER – n i just used a hand held mixer….worked just fine! Great to hear :) I think as long as the Copha is at room temperature it should work fine with any mixer. The closest thing to Crisco in Aussie is Solite but I am pretty sure that it comes in boxes for commercial purposes according to the local cake decorators (40 year old business)and cant be bought through the supermarket However they said Copha is the same as crisco but copha has a higher melting point to withstand the heat of our summers thats why it is in block form and harder to whip up and crisco is prewhipped and softened. You can grate room temperature copha the helps a lot when trying to whip it and is much kinder to your mixer. I really don’t want to use Crisco or Copha as are both made with hydrogenated fats which a really bad for your health …. Does anyone know of a non hydrogenated alternative? Or can I use lard? I spotted the picture & description on pinterest first, read through the entire article & then saw Moni staring back at me! Turns out it was your pin in the first place but goodness me I’m not a details person! 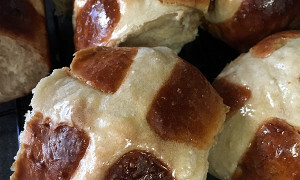 I did try this recipe once & struggled to get everything combined in the Thermomix. Keen to try it again though given our Summers are as hot as they are! Hi Sharon. The Buttercream Icing recipe is great with all butter but I do recommend using Copha as it does offer more stability in warmer weather and doesn’t require refrigeration. I made the icing specifically for that reason (February birthday party in Perth…) and it held its shape very well. I think therefore it would work well as a crumb coat and filling. Perhaps have a dummy run too as I don’t know what equipment you have and the Copha will (at room temperature) either need to be chopped up finely or grated, then whipped up into the icing. You can then assess the ratio of Copha to butter works best for you, or if you need to use all Copha. I think a balance of the two should be fine as long as you aren’t fussed about having a pure white icing. Hope it works well for you! Does the copha give the icing/frosting much of a different, or funny, taste? Also, is this very close to the kind of buttercream icing that bakeries use in their delicacies? Hi Cook :) Copha is pretty neutral and I can usually only detect it on the nose when I make Chocolate Crackles. When mixed in with a whole lot of sugar and vanilla, I can’t notice any taste difference. As for whether this is the sort of ‘mock cream’ used by bakeries I would hazard to guess not, and that most such creams use lard or some other cheaper shortening. Hi! I know this post isn’t recent but I’m just wanting to ask – will this be ok under fondant? I’m decorating a carrot cake on the weekend and was thinking of making spiced orange flavored buttercream for the filling and underneath fondant… What do you think? Would have loved to have used cream cheese buttercream but it’s really hot here atm and I won’t be able to refrigerate it once decorated. Hi, just found this site too. Have just made my usual butter cream but substituted copha for half the butter amount. Have to leave copha sitting on bench for two days before it gets soft enough to squeeze. LOL. Its in the 30’s C here too. Tastes just the same as my usual choc buttercream and has set beautifully in the fridge. Doing a trial run so will leave out all day soon to see how long it takes before it melts. If it melts too soon I may just up the amount of copha and try that. Fantastic thanks for the ideas. Hi Sharon. You can add a dash of whipping cream to try and thicken it up but otherwise it’s a case of adding more fat (Copha, butter, etc.). Frosting is pretty sweet anyway so as long as the frosting isn’t grainy, you probably don’t need to add too much more fat. Just enough so that it holds nicely. Hi, followed the recipe exactly. Didn’t seem like four cups icing sugar enough to the 500gms of copha and butter. I mixed and mixed but was still not ‘dry’ and was sugary in mouth, although lovely texture. So I kept whipping, still not dry so added more icing sugar. Was a lovely thick, white, fluffy mixture but tasted sugary still. Kept mixer on and then when I looked back was grainy and split, like cottage cheese with no liquid.!. Everything ive read says cause was too cold but if anything was hot from mixer, oven and about 30 degree day. But do not soupy or runny like too hot would suggest. Have put in fridge and will try tomorrow to rebeat. Are the ratios correct and can it be saved? How can we convert these recipes for use in the United States? As we use cups, ounces, etc here I have no earthly idea what 250 grams equals and it gets old trying to find a reliable spot on the internet to convert these. I’ve passed up lots of recipes that sounded so good but because of the gram stuff, I click off of it. Hi Lois. Thanks for visiting and yes, I think you felt the frustration that I often used to feel when reading amazing American recipes! I still don’t know what an ounce is :) Google thankfully makes things easier these days. As soon as you ask, ‘What is 30g in ounces?’, you’ll get the answer. I do try and keep measurements neutral but if a recipe is geared towards the Thermomix, I will use grams or cups at a stretch since the Thermomix weighs in grams. Hope you could find the right measurements in the end. Thanks for the reply. Yes, I’m familiar with Google but if I find a dozen recipes that I like and 10 of them have these grams instead of the way I’m familiar with, I do not have time to go to google and get all the measurements so I’m sure I’ve passed on some very good recipes and just searched for something that is in the measurements that I’m familiar with, cups, ounces, etc. I get several emails daily that contain recipes so usually can find one that I can use. This one just looked so good but guess I’ll once again pass. Thanks again.